Echo Rowing: Rowin' with gators? Finally downloaded my recent photos. The top photo is my ECHO on a tiny bit of beach at Northeast Creek in Jacksonville, NC. Gotta be careful where you stop around there because of our resident big-toothed alligators. Then there's me - getting ready to row back from Northeast Creek to Southwest Creek, way back behind me somewhere. 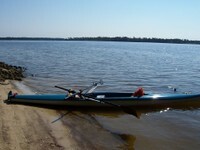 The third photo is a great place I found to row a couple of weekends ago in New Bern, NC....the Trent River. We've taken snapshots of Echo Enthusiasts from all over. 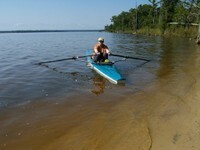 If you have photos you'd like to share of you and your Echo Rowing Shell, please email them to us! We're in Annapolis- Stop by to visit! My Echo shell is longer than my car!